Are you looking to adopt a pair of rats for the first time? The following are the steps you will need to take to prepare yourself and your home for adoption. Scroll down to start! Below you will find the order in which you would be able to best investigate rat care. Learning about rats is obviously the first place to start when deciding whether or not you will be adopting. Behaviour and health are the most important factors to consider when choosing rats in comparison to other pets! The following links go into detail on rat behaviour and health. Please read through these pages! I know there are quite a few, but these are all important towards choosing a new friend. I know there are a whole bunch of links to follow, but please follow them all to collect all the information you need to know about owning your pet rats!! 1. More than one or you keep none. - Important to know. Rats must be adopted in pairs, so there is no "only having one pet". 2. Rats Vs. Other Pets - details towards smell, behaviour, space requirements, etc. 3. Will my Rat like me less if it has a friend to love instead? - a common question follow up on rats needing to be adopted in pairs! 4. Do litter mates/siblings get along better than rats that are not siblings? - applies when considering what pair of rats to adopt. 5. Differences between males and females -applies when considering what pair of rats to adopt. 6. Rats as cuddly pets / Lap-rats - details towards behaviour and interactions with humans. 7. Adopting older rats vs. adopting younger rats - applies when considering what pair of rats to adopt. 8. Basic Rat Training & Tricks - details interactions and fun you can have with your rats! 9. My rat is making noises, are they communicating with me? - details on rat behaviour and health. 10. How do I know if my rat likes me? - applies to interactions between you and your rats. 11. Where/how do I pet my rat? - applies to interactions between you and your rats. 12. How do I know when my rat is upset? / When my rat is territorial - applies to interactions between you and your rats as well as your rats and their friends. 13. Common rat terms - applies to interactions between you and your rats. 18. Rats as Classroom Pets - applies to those who wish to take their rats on trips or keep their rats in a busy area. 5. NEVER CUT or otherwise ALTER YOUR RAT'S WHISKERS! 7. My rat is making noises, are they communicating with me? Where should you adopt your rats? After you feel fully comfortable and confident that you will be able to provide for your rats, that you are fully ready to deal with any health issues that may arise, and that potential rat mannerisms and behaviours will fit in with your household, it is time to decide where to adopt your rats. There are five main places you will find rats for adoption. I will be making generalizations about each source, so please research facilities before making a decision on where to adopt. 5. Kijiji or other ad listing sites. 1. Living conditions - living conditions vary between breeders. Rat housing varies between plastic bins, modified bins (bins with ventilation and bars installed) and barred cages. Breeders often keep their rats in a larger and more enriched space than other agencies. Myself and the breeders I work closely with keep their rats in large Critter Nation cages with toys, hammocks, wheels, etc. for optimal enrichment. 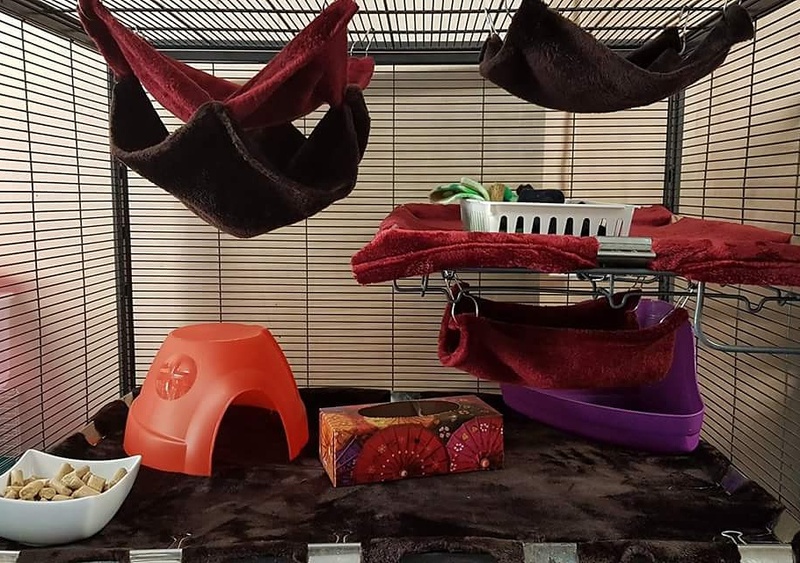 Large and enriching set ups are recommended for all adopters, and rats that come from breeders are often treated like the breeders own pets rather than an item to sell. 2. Customer support - breeders most often encourage a large amount of communication and are available to answer all your rat related questions for the span of the time that you own rats. Customer support is largely available. Your breeder may also send surveys every now and then to track your rat's progress, behaviour and health to make sure everything is going as planned. 3. The origin of the rats - Breeders often put a large effort into finding the best rats for their lines and will track their lines heavily to make the best pairings possible. Whether the rats come from a pet store, feeder bin, or another breeder, all rats are tracked and notes are considered when pairings are being made. 4. Interactions and treatment of the rats - most breeders will handle their rats daily. Whether this is socializing the rats (allowing them to wander about, teaching shoulder rides, playing, etc) or just checking that your rats are in good shape (checking for any health issues) your rats will be closely monitored and inspected daily. They will likely get a few pets and kisses in the process whether or not it is just a basic health check. 5. Availabilities - breeders may not have an abundance of adoptables. Most breeders have only a few pairings per month, if even that. You may have to wait to adopt your new rattie friends. Breeders may also have a larger selection of rat types. 6. Adoption process - the adoption process for rats from a breeder is often much longer and more detailed. Most breeders have a questionnaire to fill out before adoption and you may have to wait on a waiting list before adopting your new friends. 7. Cost - breeders will often have a higher cost to adopt than other places. This is because of the few pairings they are making a month and possibly because this is a full time occupation for them. Their rats may also be of a "rare" sort and would be priced higher. Breeders tend to put more work in on their rats so adoption fees must be higher. Research breeders in your area and these factors for each breeder to find one that suits your needs. 1. Living conditions - living conditions vary between shelters and rescues but are often suitable for rats with enrichment and proper housing. Check with your shelter for a description of living conditions. 2. Customer support - rescues are often less informed on rat care and how to treat their rattie friends, but this varies at an extreme degree between shelters. For customer support, if you are adopting from a rescue, I would recommend contacting a breeder to learn more about your rats or if you have any issues. 3. The origin of the rats - shelter rats come from a variety of situations. Rats may be surrendered because previous owners could not care for them, because they are ill and previous adopters cannot care for them, or because they are aggressive and adopters do not want to interact with them. Shelters also often receive rats from feeder bins that people bring to them hoping for better care. Because of the variety of situations your rats may have come from, be cautious when adopting a shelter rat. Be sure to inquire into the rat's past and to handle the rat/rats before adopting. If you are adopting females, check for signs of pregnancy and be ready for the possibility of pregnancy. 4. Interactions and treatment of the rats - shelters in my area are known for being pretty good at caring for rats and handling them daily. This is important especially at a shelter as one must confirm that the rat has been socialized to weed out any bad genetic predispositions. Please check with your shelter regarding treatment of the rats. 5. Availabilities - shelters have varying availabilities based on the amount of surrenders. 6. Adoption process - adoption processes at shelters are usually pretty thorough and involve filling out a questionnaire to make sure that you are ready to adopt. 7. Cost - Costs to adopt at shelters are usually mid-range, shelters may also adopt rats out for free. Research shelters in your area and these factors for each shelter to find one that suits your needs. 1. Living conditions - pet store living conditions are usually very poor. Rats are kept in small tanks with little enrichment, and often dangerous wheels. Males and females are often accidentally housed together which increases the risk of pregnancy for those bringing female rats home. 2. Customer support - customer support is rarely provided and pet store information on rats is full of poor and false information. Pet stores are more about sales of products than rat care most often, so be wary of information that pet stores provide. This being said, pet stores will often provide a free health check on your rats. 3. The origin of the rats - the rats found at pet stores are often from pet mills where rats are bred in bulk and without any thought toward selection. Pet mills are often dirty and unhealthy and pairings are poorly made. Rats are overcrowded and mistreated. The origin of pet store rats is often the same as reptile store rats. 4. Interactions and treatment of the rats - depending on the pet store and it's employees, rats are minimally socialized. Some pet stores will handle their rats daily to improve temperament and to do health inspections, some will not handle their rats at all. Ask your pet store about this. 5. Availabilities - pet stores almost always have rats available. Pet stores often have "fad rats" available with pretty looking rats or "rare" rats. 6. Adoption process - the adoption process does not consist of anything more than signing a piece of paper. 7. Cost - cost is low to mid range. Research pet stores in your area and these factors for each pet store to find one that suits your needs. 1. Living conditions - feeders are kept in Tupperware bins with wood shavings as bedding. Bins are often overcrowded. Bins do not have any form of enrichment save for a water bowl and food placed on the bars overhead. 2. Customer support - reptile stores will usually give you pretty good information regarding rat care and will be more available to answer questions. As many deal with feeder breeders, their information is usually up to date. 3. The origin of the rats - feeder rats are often from pet mills where rats are bred in bulk and without any thought toward selection. Pet mills are often dirty and unhealthy and pairings are poorly made. Rats are overcrowded and mistreated. The origin of pet store rats is often the same as reptile store rats. Reptile stores however will often do some of their own breeding and put a bit more thought towards pairings. Depending on the reptile store, rats may be in great condition or very poor condition. Inspect your rats carefully before adopting especially for pregnancies, mites, lice and respiratory infections. 4. Interactions and treatment of the rats - rats are not interacted with in a pet fashion when they are from a feeder bin. 5. Availabilities - rats are always available from a feeder bin. They will always have rats available, often with a good range of types of rats. 6. Adoption process - No adoption process. You choose your rats from a bin. 7. Cost - cost is very low. Research feeder breeders in your area and these factors for each feeder breeder to find one that suits your needs. Kijiji or other ad listing sites. 1. Living conditions - varies greatly. Be sure to ask the previous owner about living conditions. 2. Customer support - usually no customer support is provided. 3. The origin of the rats - varies greatly. Ask the previous owner about origin. 4. Interactions and treatment of the rats - varies greatly. Ask the owner about their treatment of their rats. 5. Availabilities - rats, especially older rats, are always available on kijiji or other ad listing sites. 6. Adoption process - depending on the previous owner, the adoption process could include a few questions. Often the adoption process is short. 7. Cost - cost varies depending on the previous owner. Research each poster on your ad listing site and these factors for each poster to find one that suits your needs. So you've decided where to adopt your pet rats? On to the next step! Time to decide where your rats will live. Which room will you keep your rats in? There are a few factors that go into choosing the room that you will keep your rats in. 1. Temperature and humidity. Rats need a temperature between 18 and 23 degrees to stay happy, healthy and energetic. The room you keep them in should have a constant temperature with very few temperature changes. Humidity ideally is kept between 40% and 70% to keep your rats respiratory systems healthy. Rooms with a bunch of windows are not the best for keeping rats in as they will be subject to temperature and heat fluctuations. 2. Cleaning. You will want to keep your rats in a room that is easily cleaned, and in one that you can easily take the cage apart and clean in. Carpeted rooms can be annoying for cleaning, so you may want to keep a tarp under your rat's cage if you are keeping them in a carpeted room. 3. Smell. Rats, of course, do give off a smell. You will want to keep your rats in a room with which their own smell will not bother anyone. 4. Scent and smoke free. The room your rats stay in should be scent and smoke free, and also free of air fresheners such as febreeze. There should be no incense, sprays or smoke present in your rat room. 5. A room where no one will be bothered at night. Rats are most active in the nighttime so it is best to keep them in a room where they will not bother anyone throughout the night. I would keep them out of bedrooms personally, though if you are a heavy sleeper this may not matter! 6. Interactions. You still want a room in which you will be able to interact with your rats regularly in. Rats love to be in social family rooms where they get the most attention and can observe the most activity! You may also want to keep them in a room that is safe for free-range time, one in which rats can run freely throughout the whole room without too much supervision. So you've chosen your room? Onto choosing your cage. When choosing a cage you will want to go with the cage with the most space, solid floors, and room for enrichment. Below I have listed my favourite cages available in Toronto! - Easy to clean. 30 minute clean time estimate with fleece. - Easy to hang hammocks/cage accessories over all levels. - Levels work well with fleece- large binder clips fit over levels. - Tons of space!!! A DCN can fit up to 8 ladies and 6 boys. Lots of space to climb around. - Does not work well with bedding other than fleece. Pans are shallow and fleece falls through the bars. Deeper pans can be ordered online. -Bars must be deep cleaned. A spray bottle with vinegar and water, steel wool, a cloth, a toothbrush and a toothpick are your best tools for doing an in-between-the-bars deep clean. - Great amount of space. Can home up to 6 girls or 4 boys. Lots of space to climb around. - Works well with bedding bottom and fleece on shelves. - Pretty good for hanging hammocks. - A bit more steps to the cleaning process. Will take around 30 mins to clean fully. - Levels are a bit more difficult to fleece. Would suggest attaching fleece with safety pins. Fleece cannot go on bottom pan. - Bottom level is easier to chew apart. Be sure to keep lots of distractions on the bottom level. Recommended bedding: Aspen or carefresh for bottom bin and fleece secured by binder clips for upper levels. - Great amount of space for 2-3 rats. - Easy to hang hammocks and baskets. - Easy to clean- 15-20 minutes clean time. - Plastic bottom is easier to chew apart. - Cannot secure fleece to bottom pan, but works well for other types of bedding. - Bars get messy faster, would recommend doing a bar cleaning (extra 10 mins of work) every week. - Please do not use the "rat food" provided! It is not wholesome. - Flooring must be solid. Barred floors are unhealthy for rattie paws and can lead to bumble foot which is painful for your rat. -Space requirements. Rats generally require 4 cubic feet of space per pair of rats (2 cubic feet per rat) and in every case, the bigger the better. Cages under 4 cubic feet are inappropriate for rats. - Walls should be barred. Tanks are not appropriate living spaces for rats unless used solely for quarantine or a very short adjustment period. Hamster cages, guinea pig cages or rabbit cages are not suitable living quarters for full grown rats. Decided on a cage? On to choosing bedding and decorations! Accessories are important for your rats happiness!! Keep them active and playful by providing them with a whole bunch of toys. food dish, hut, tissue box, litter box, play box, 3 hammocks. Keep your rats comfortable by having a cage equipped with hammocks, a plastic hut, a wooden bridge, a food dish and a water bottle! For your rat's enjoyment, provide them with toys such as tissue paper rolls, tissue boxes, anything cardboard basically and dangling wooden toys! - Can be used in bin cages. Can be used in barred cages if additions are purchased. I personally find aspen more messy as rats can have “bedding parties”. - Daily spot cleaning can be done, more material must be removed in spot cleans. - Ammonia build up takes longer. When doing a full clean, unused spots of aspen can be recycled. bag. I would recommend freezing every bag purchased before use. 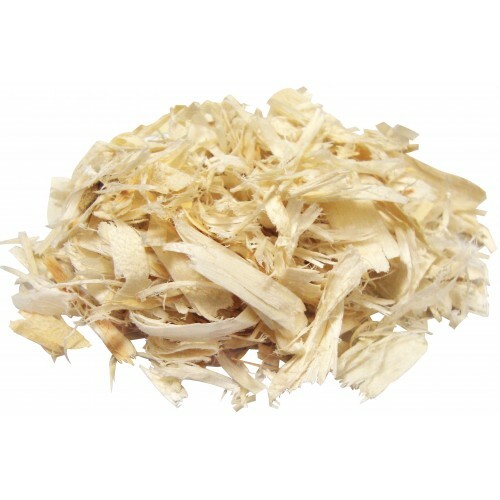 - Cost effective when bought in bulk. - Smells nice though I do know some can be allergic to the smell. Does not smell too strongly. - Can be used in bin cages. Can be used in barred cages if additions are purchased. Allows for rats to have “bedding parties” if used in barred cages which makes it a bit more messy. - I find it is less absorbent than other beddings. it was causing RIs which is one of the reasons I would caution against using Carefresh. as the cage gets dirty! This is a matter of opinion however, some find it smells less than aspen and thus prefer it for scent. Other beddings that can be used safely are "Kaytee Soft and Comfy" bedding (known to be dust free, without smell, relatively cheap, good with absorption and great for burrowing), flax bedding, paper bedding and non-dyed newspaper beddings. So your cage is completely set up. Now to feeding your rats! Your rats will need two different styles of meals. The first is their staple diet, to be provided in their cage at all times. The second is their enriched diet, coming from your own table. To keep your rats healthy, feed them extra (safe) vegetables, fruits and other foods daily! Mazuri lab blocks have a fantastic balance of ingredients and are a great staple diet for your rats. These lab blocks can, and should, be kept in the cage at all times so rats can eat when they desire. Mazuri blocks are most often sold in bulk online, but can also be purchased from the Rat Emporium for $20/5lbs. Oxbow lab blocks are the store bought equivalent to Mazuri lab blocks. They are a great staple diet for your rats and can, and should, be kept in the cage at all times so rats can eat when they desire. Oxbow blocks can be found in almost every pet store and cost 25.82$/5lbs. Vegetables, fruits and other foods from your table should be fed to your rats daily to keep them healthy! Giving your rat an enriched diet can really improve their health and lifespan. A list of foods that are safe and unsafe for rats can be seen here. Please DO NOT feed your rats any seed mixes from any pet store, no matter the recommendation. Seed and nut mixes are very fatty and are not good as a consistent diet for rats and are also full of foods that have no nutritional value for rats such as dried corn that can actually damage their digestive system. 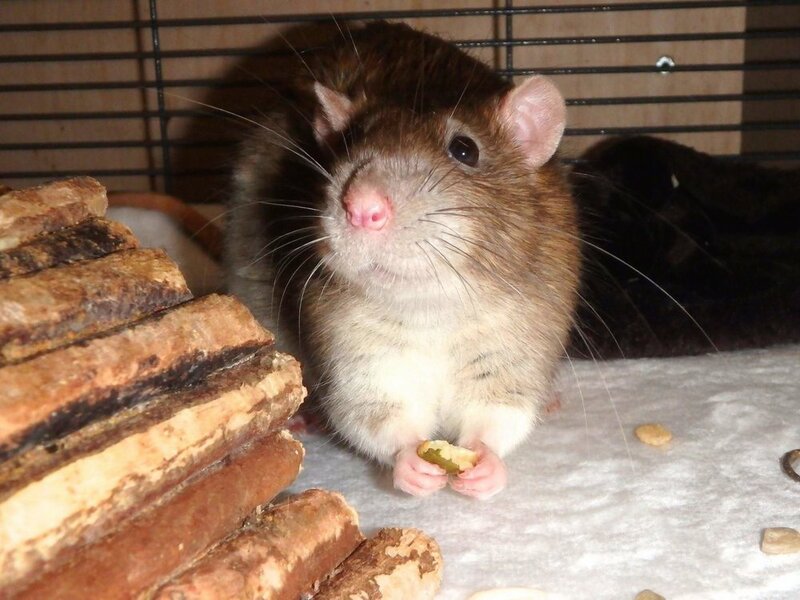 Nuts and seeds should only be fed as a treat, and be sure to check if they are safe for rats before giving it to them! Keep water available for your rats at all times!! Always keep your ratties' water bottles full and fresh. Now that you have researched your rats, time to talk maintenance. Of course, initial cost and preparation for your rats will be drastically different than rat maintenance. These are the two easiest things to keep up! Simply top up your rat's food dish when it is close to empty, and clean out and top up their water supply when it is running low. Be sure that your rats are not without food and water at any given time. Feel free to feed them scraps of your meals or make them their own mini meals every day! Check out the list of safe vegetables, fruits and other food and keep them fed well on the daily. Depending on the cage you have, bedding your using and number of rats that you are housing, cage cleaning frequency may vary but the need to clean will hover between every 3-5 days. Be prepared to clean your rat's cage around two times a week. Cleaning with hot water and vinegar is most effective, keeping your cage disinfected and less smelly than if you use any other cleaning brands. If you do regular scoops of the cage you will have less to clean at each cage cleaning! Be sure to keep your rat room dust and scent free. You will likely have to purchase 5lbs of rat food every couple of months if you own two rats. In addition to this, you will need to buy bedding monthly or every few months depending on which bedding you are purchasing. Overall, your monthly costs will come to around $20/month (my estimate) which greatly differs from their original cost which I estimate to be around $300-$400 if you purchase all materials necessary (cage, huts, wooden toys, water bottles, food dishes, beddings, rats). It is best to invite your rats out for playtime daily!! Be prepared to spend a couple of hours with your rats every day whether it is just with you doing something else and them running around on the floor, or you cuddling with them or taking them on shoulder rides. They are social animals and love to spend time with you!